If you’re entertaining this holiday season, you’re likely thinking about picking up seasonal wreaths and decor like festive napkins, votives and the like. While accessorizing is important, it’s also crucial to ensure your home is equipped with beautiful, functional furniture that will support all of the guests coming in and out of your house. Whether you’re planning to host a holiday cocktail party, or you have a family coming to stay for the weekend, there are a few pieces that will make your life easy and your home beautiful! Read on for our favorite finds. 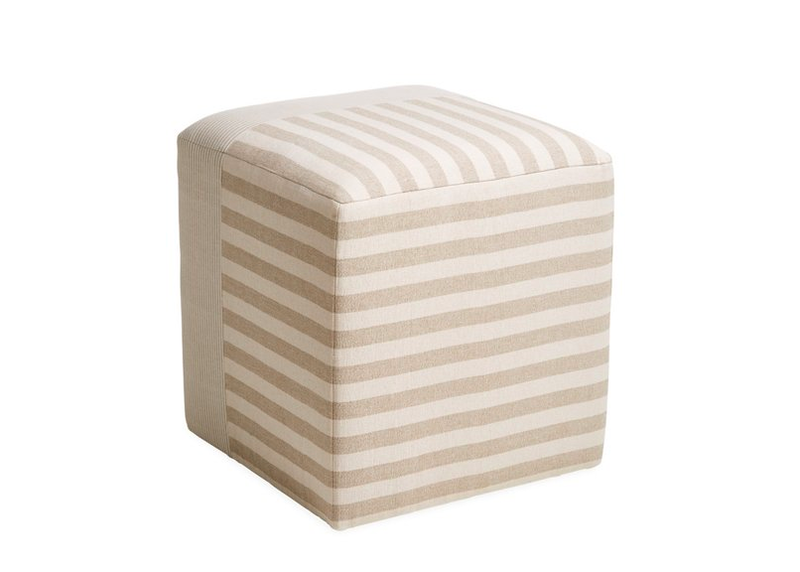 Small ottomans or poufs are workhorses for every home. Lightweight and easy to move around, they’ll come in handy as extra seating when guests pop in. 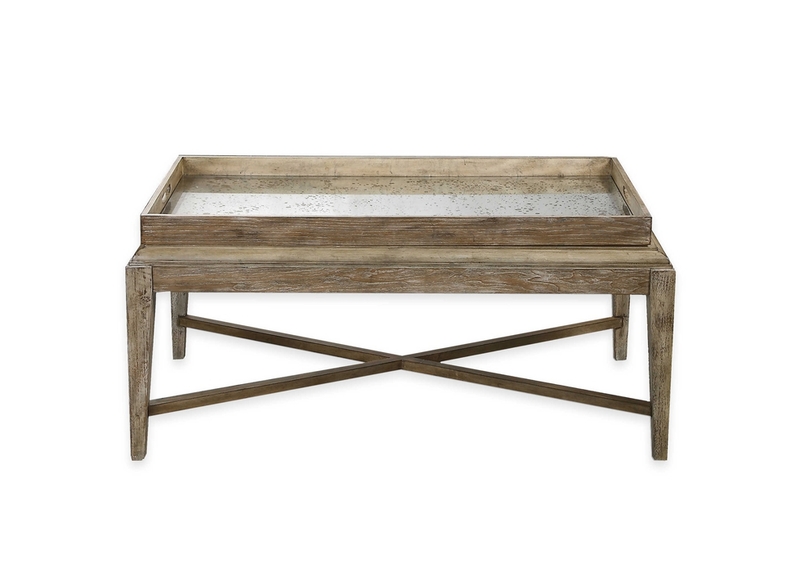 They can also be used as side tables—top one with a tray or coffee table book and you have a perfect surface to hold cocktails and the like. 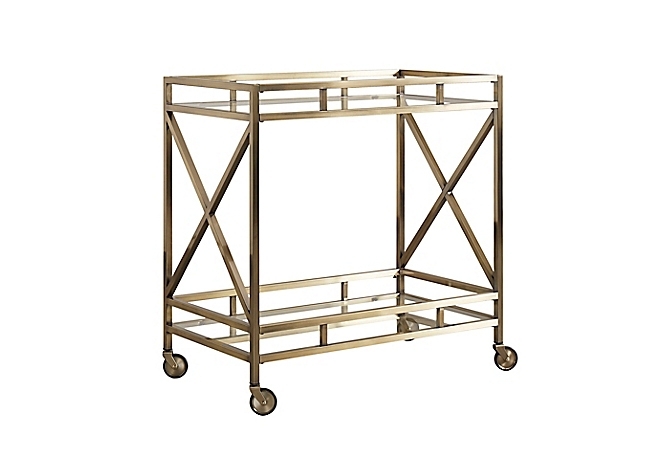 If there’s a holiday cocktail party in your future, a bar cart is a must-have for the season. Not only do they offer lots of opportunity for beautiful styling, bar carts can help draw guests who might otherwise linger in the kitchen into the dining room or living room. Top your bar cart with wine, a specialty cocktail, a non-alcoholic option, and a few versatile spirits like bourbon and gin, and let guests serve themselves. Do you know the term “small space” well? 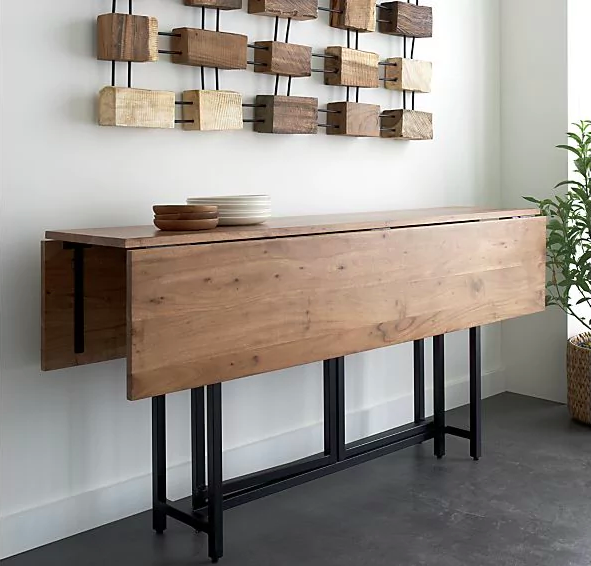 If you’re challenged by square footage, but still want the option of hosting dinner parties, a drop leaf dining table will come to your rescue. We love Crate and Barrel’s Origami Drop Leaf Rectangular Dining Table, which can unfold on special occasions to transform from a slim, compact console into a party-ready dining table. If your home is low on guest bedrooms, and you regularly entertain family or friends for holiday weekends, a sleeper sofa is a great investment you (and your guests) will be glad you have. There’s no shortage of sleeper sofas on the market, so find one first and foremost that suits the style of your interiors. 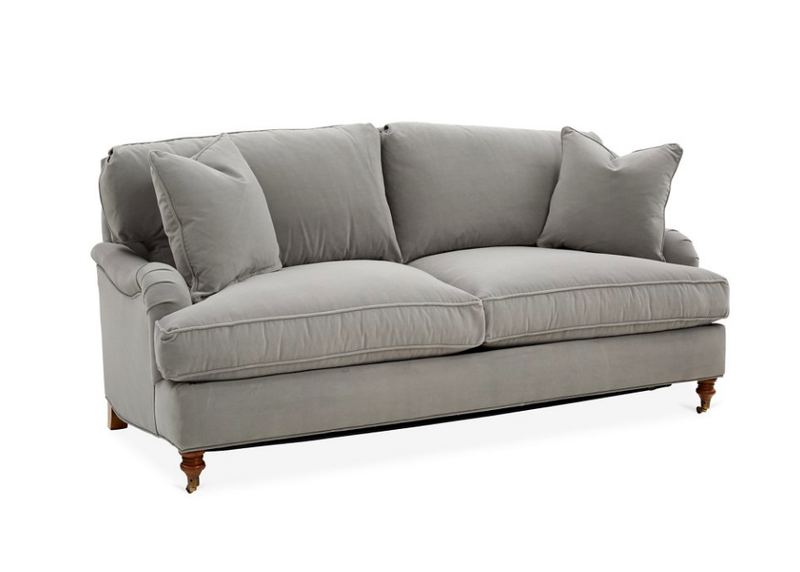 We love this queen-sized sleeper sofa from One Kings Lane, with its English roll-arm shape and luxe velvet upholstery. Serving appetizers, drinks, and more—and cleaning up the morning after your holiday—will be a cinch if you have a coffee table with a removable tray top. Simply load up the tray with hors d’oeuvres and beverages, and have someone strong deliver it to the living room or kitchen. When your living room is crowded with thirsty revelers, you’ll be wishing you had a few more extra surfaces for coasters. 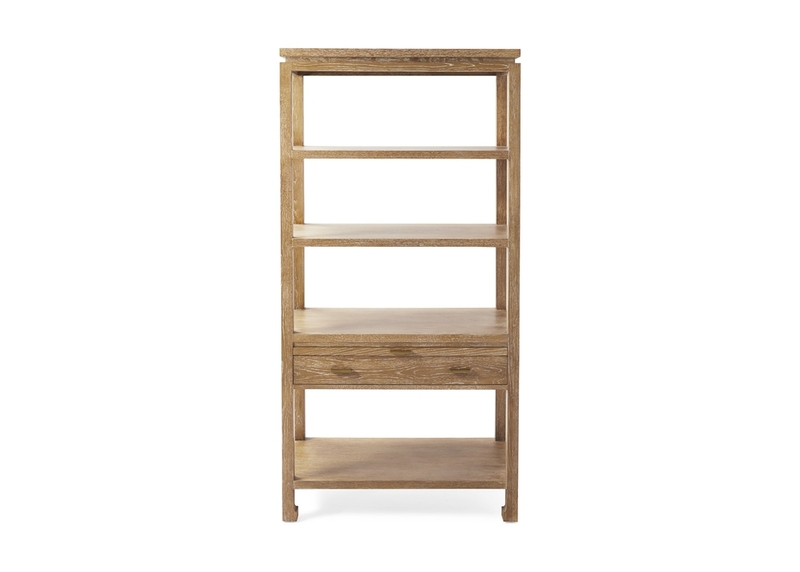 A bookshelf always comes in handy, but Serena & Lily’s cerused Reese Bookcase goes the extra mile with its roomy storage drawer and a pull-out shelf that can serve as a mini bar when guests arrive. Only have room for one armchair in your living room? Get a chair-and-a-half! 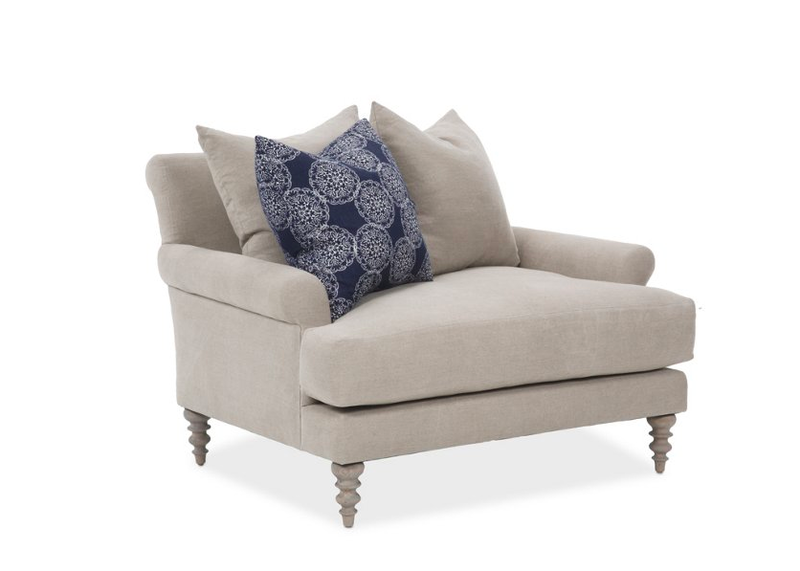 This spacious chair is a welcome addition to any room, as it can host two guests cozied up on those days and nights when your house is brimming. Kids especially will love curling up with siblings and cousins on this h seat.